We’re all familiar with SEO. It’s how we optimize our web content to rank high in search engines. But what is Enterprise SEO? Enterprise SEO scales regular SEO activities to optimize thousands of pages. Because of this overhaul of page content, practices such as project management, collaboration, competitor analysis, etc. are essential. Now we have an idea of Enterprise SEO. It’s time to get into the specifics. The idea of improving search engine visibility stays the same. The only thing that changes is your strategy for getting there. Let’s dive into these traits. The defining feature behind Enterprise SEO is the volume of content. Because Enterprise sites contain thousands of pages, there’s a lot more optimization to take care of. Keep in mind these two ideas. Don’t let pages slip through the cracks. Optimizing thousands of pages means you may miss a few. Your goal is to make sure all pages have an SEO score over 50%. Watch out for duplicate content. This is a silent killer of Enterprise SEO. Enterprise sites have pages with similar content. But you have to ensure all pages are targeting unique keywords with original content. Optimizing large content volumes calls for a coordinated effort. This leads into our next Enterprise SEO trait – working with remote teams. We have to discuss team collaboration when asking “what is Enterprise SEO”. This is because improving Enterprise SEO involves a range of marketing team members. You have other Marketing Managers who have a hand in steering the SEO ship. Marketing top brass is also looking at the business value of your efforts. And don’t forget web-dev teams who implement SEO changes to your site. 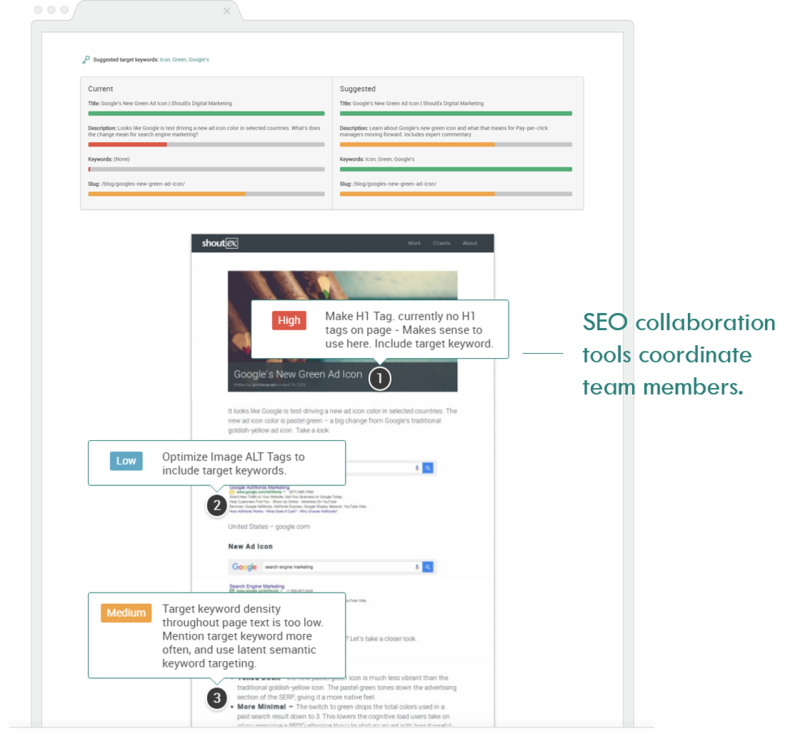 This makes effective collaboration keystone in Enterprise SEO. If not, changes are slow to put in place, or even worse, not implemented at all. 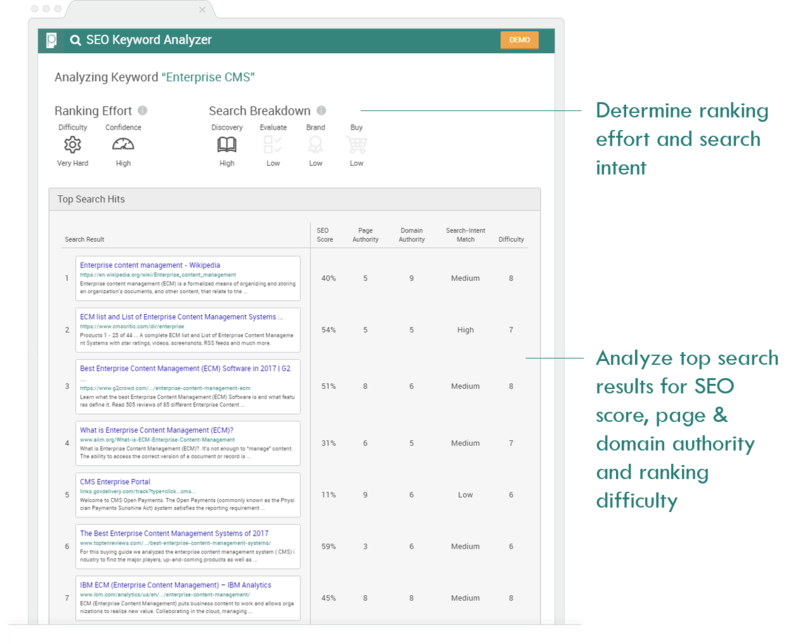 Enterprise SEO starts with site-wide analysis and team collaboration to get the ball rolling. Now it’s time to look outwards. 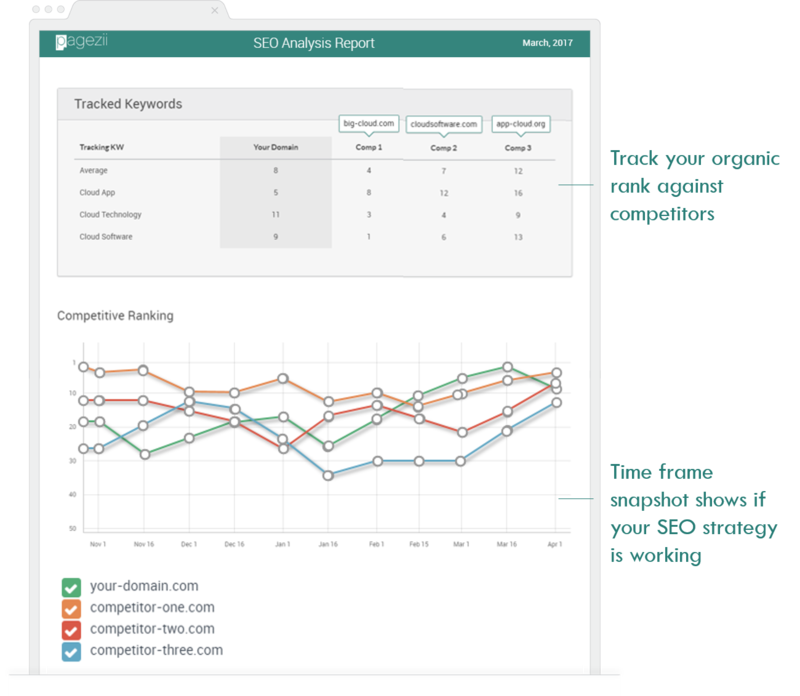 Competitor analysis is an important part of any SEO strategy. But what makes Enterprise SEO unique is competitor concentration. This means there are a few players with a ton of authority in your space. Not only that, but they have resources to scale SEO strategies quickly. First look at competitor keywords. You want to focus on where competitors are ranking for keywords important to your business. This guides your strategy. If you discover a valuable keyword for your business which competitors rank low for, you can capitalize. You’ll also want to look at competitive rank over time. This shows you if new strategies are paying off. It also shows you when your competitors are ramping up their SEO game plan. 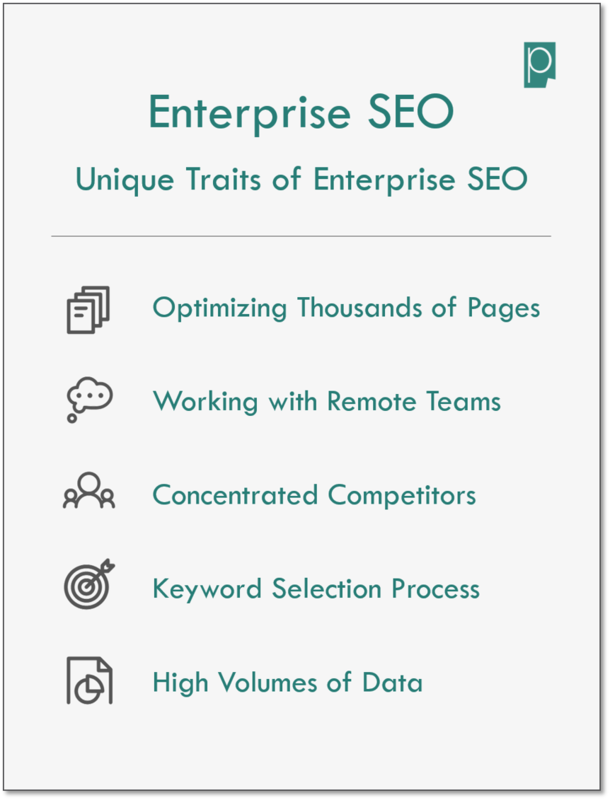 We’ve covered the diagnostic perspective of Enterprise SEO. Now we can start looking into strategies moving forward. Targeting keywords in regular SEO is tough. But because we’re talking Enterprise SEO, keyword targeting requires a different mentality. Well, for Enterprise SEO, keyword search volume is not the dominating factor behind your targeting. 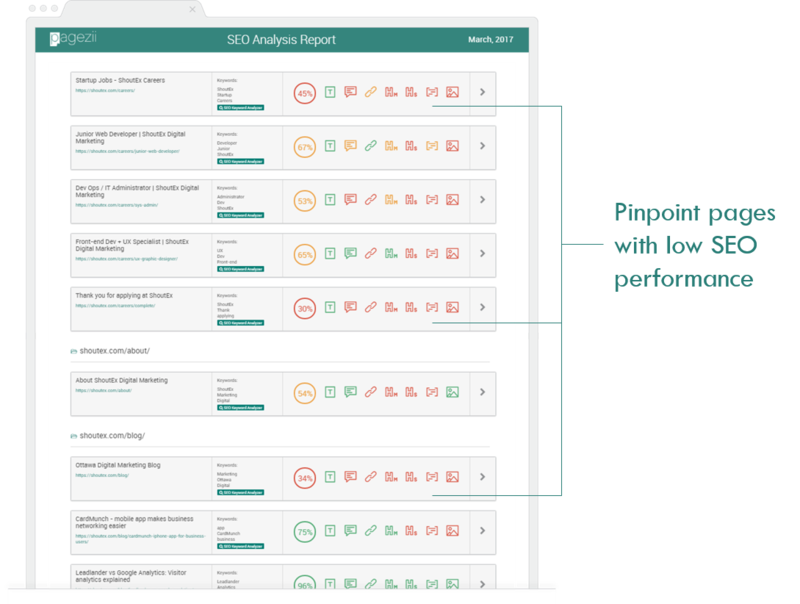 You want to look at other factors, like ranking difficulty and search intent match. You also want to gauge how confident you are for overtaking ranks. Enterprise SEO Managers have to factor in ranking difficulty, search intent, and existing results to inform their decisions. If you see established competitors ranking high for your target, it’s going to be an uphill battle. And that’s the idea of high volumes of data. You have thousands of pages to analyze. Concentrated competitors to outrank. And stringent keyword components to think about. This all boils down to a lot of data to crunch. The key to succeeding is staying on top of the data. We’ve covered the fundamentals of Enterprise SEO. You now have the knowledge and tools to take your Enterprise SEO strategy to the next level. Would you add any points to our definitive answer? Make sure we hear about it in the comments below.